Composite textile factories are one of the major parts of textile industry in Bangladesh. As there are different specialized textile manufacturing factories i.e. spinning factories, weaving factories, knitting factories, dyeing factories, apparel manufacturing factories etc. 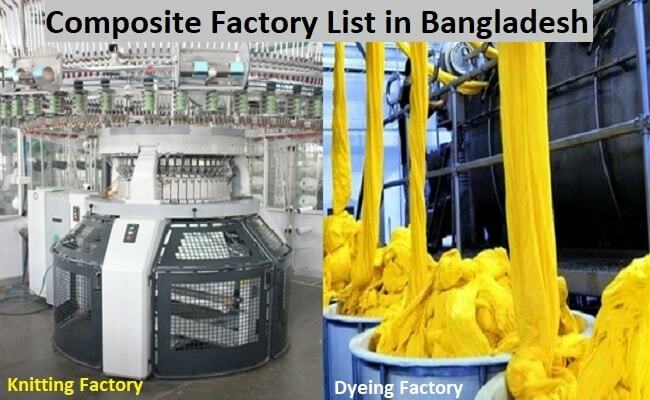 there also a lot of composite textile manufacturing mills in Bangladesh. Among those, a list of twenty composite textile mills of Bangladesh is listed here according to their alphabetical numbers. Writ your valuable comments or suggest your desired factory name if you have any query about this list. 7. The List Of Top Printing Factory In Bangladesh. 3. Ashik Composite Textile Mills Ltd.
4. Ashiyan Composite Textile Mills Ltd.
40/2 North Avenue, Gulshan-2, Dhaka-1212. Factory Address: Vill: Gugiam, Union: 12 No. 5. Anik Composite Mills Ltd.
Head Office Address: 62, Fulbaria City Super Market (6th Floor), Dhaka. Factory Address: Balaisa, Bhulta, Rupgonj, Narayangonj. 9. Knit Cotton Composite Mills Ltd. Factory Address: Baraibough, Enayetnagar,Fatullah, Naryangonj. 10. Mosharaf Composite Textile Mills Limited. Head Office Address: House- 9/1, Road- 12, Kalyanpur, Dhaka. 13. Melon Tex Composite Ltd.
14. Noman Knit Composite Mills Ltd.
(4th Floor), 115-120 Motijheel C/A Dhaka- 1000. 15. Naheed Composite Textile Mills Ltd.
(12th floor), 12, Kawran Bazar C/A, Dhaka-1215. 16. Prime Composite Mills Ltd.
17. Sarah Composite Mills Ltd.
Road # 3/F, Sector # 09, Uttara, Dhaka-1230. .
20. Suprov Composite Knit Ltd.